Darnel had come to Christ while in solitary confinement at the county lockup. A drug addiction had caused him to neglect his diabetes, and diabetes took his eyes. Now he was out, blind, and looking for something to do for Jesus. It was a beautiful spring day at a festival in a nearby town. The square was thick with revelers, some of whom had been partying for days prior. Shane led Darnel out to the center of the square. Out of Darnel's mouth erupted this thick dark rich baritone that Shane would forever refer to as The Big Beautiful Black Man Voice. Fortunately Darnel was blind, so he didn't see the cops approaching. "Afternoon officers, can I help you?" "Why are we breaking the law?" "He needs to stop so we can talk to you." "Ok, now, how can I help you?" "Sir, you cannot stay here and do this." "Am I breaking the law?" "It doesn't matter. You cannot stay here and do this." "That's unfortunate. Am I breaking the law?" The officer sighed. "Sir, you're violating a noise ordinance." "You mean the noise ordnance that says no greater than 85 decibels sustained for at least one minute of a 10 minute period?" The other officer saw where this was going and said "I can measure decibels on my phone." Shane shrugged. "Sure, but the first question my lawyer will ask is whether or not you complied with the statute which requires a licensed operator and a calibrated meter measured from the source of the complaint. So unless y'all can show me that we are breaking the law, we intend to resume preaching." "Brother, we going to jail?" The cop came back over. "You need a parade permit." "This is an unlawful assembly." "Only if it was over 25 people." They walked away again, more conversations over the radio. "Sir, we are going to arrest you if you don't stop." "What law have I broken?" "None, but the only way to get my phone to stop ringing is to arrest you." "Look, we're going to lunch, and after lunch we will come back here and preach." "We'll be waiting for you.". It turns out they weren't waiting for him. "See Darnel, I told you we weren't going to jail." "Hmph. I tell ya, brother, I aint got no time for the back of that police car." But Darnel was hooked. Despite his handicaps, Darnel was at every event, every corner. He became Shane's most stalwart, and unlikely companion. Together they knocked every door in their town, attended every festival. One day Darnel asked Shane a favor. "Can you take me to Tallahassee?" "A boy I used to run with was in an accident. He's in an nursing home, and I want to go tell him about how Jesus saved me." "Sounds like a plan. Maybe I'll even let you drive." On the way down Darnel said he had spoken to a local pastor in the area who had gone to see his friend, and that the friend was injured, but lucid. "That's good news, right?" "I hope so. brother, I hope so." A dark nursing home bed. "It's me, Darnel. We come to see you" An uncomprehending grin. The foggy dazed look of a brain injury. An uncomfortable silence. He barely knew they were there. "What now, brother?" "That pastor said he was up and talking!" "I really don't know, D"
They stood there for a few minutes. Sometimes it looked like he recognized Darnel, but mostly he just moaned a bit and grinned. "Come on, man, lets go home." It was a quiet car ride. The new preaching spot was perfect. It was the sidewalk outside the middle school. For roughly 40 minutes in the afternoon, there were hundreds of kids walking past them and hundreds of parents sitting in their cars waiting. What could go wrong? Well for starters, during that actual 40 minutes the sidewalk was full of cars in an attempt to not block the road. Anybody on the sidewalk was inches away from them with a ditch behind him. Preaching there meant you were preaching inches away from your audience. "You can't do that" said an approaching cop. "you can't stand in the road,"
"Nope, Cars were here first. It's a road, and its unsafe to stand there." The cop kept them hung up arguing the obvious until the crowd was gone. Shane had a plan. Get there before the cars did. "Nope, you gotta move. Cars need to use the sidewalk so they don't block the road"
Once again, by the time they sorted it out, the crowd was gone. New plan. We stand in the lee of the stop sign. Cars cant fit in there. "What could it possibly be this time, officer?" "Now you're on school property." "Wait, this stop sign is on school property?" "It's part of the sidewalk." "The sidewalk is school property." Shane sighed. "No, it's not, officer, and I don't know why you keep harassing us." "It's school property from 3:30 to about 4:15"
"That's not how it works." The cop shrugged. Shane shook his head. In a lifetime of ridiculous situations, this was one of the worst. "You do have a boss, don't you?" "It's not our policy. The principal decides where school property stops." Shane pointed towards the school. "The principal in THAT building over there?" "Let's go see the principal, Darnel." "Sir, we're.." "I know who you are." the principal interrupted as he spread his hands in a magnanimous gesture. The situation was explained to him. "Let me tell you gentlemen what the problem is. I've got about 40 minutes to get 1000 people safely off this campus, and you fellows are in the way." "Look, I'm not against you. I'm active in the church myself." Shane rolled his eyes. Here we go again. The principal leaned forward, taking an authoritative pose. Bar fighting had taught Shane an instinctual knowledge of body language. "Do you know how many pedophiles there are around here?" "Parents are already concerned about their children's safety, and you two just add to their concern." "You do understand that the solution to pedophilia is the gospel of Jesus Christ, right? That the two guys with scripture signs and t shirts aren't the villain?" "Now, I can't make you stop.."
"No, you can't." Off to his side, Darnel quietly said "Calm down, brother." The principal continued "So let me offer a solution; a compromise. Stand on the other side of the street, facing the school. Everyone on foot and everyone in the cars will still be able to hear you." Darnel said "That would work." Why didn't I think of that? Shane wondered. The next week , from the other side of the street, Shane and Darnel watched that same principal steer the crowd away from them and towards a foot path on the other side of the campus. "That what he means by being on our side?" D asked. "Darnel, if they are going out the other gate that means they are cutting across the parking lot of that jewelry store." "That's true. Mr James's place." "So we are going to go ask permission to preach on private property." "You want to do what?" the jeweler looked up, the loup still in place. "Stand in your parking lot and preach to the school kids." "Huh." A pause." Will it stop them from cutting across my parking lot?" "Do it. Anybody harasses you, you send them my way." First time out, the police arrived in a shiny car. "You guys cant do this here. It's private property." "Officer, you should go talk to Mr. James." There were no more police visits after that . This is obviously part 3 of the semi-autobiographical story that came about as a result of the #VSS365 writing. Should you care to read it from the beginning, Part 1 and Part 2 are available. Eventually there was a girl. A woman, to be fair. Pretty. Very pretty. He took her street preaching, and she watched people abuse him. It was a new thing for her, but she didn't run away. Some of the young guys stayed. Most did not. One of those young guys was a big strapping sort with a magnificent voice named Howie. Lots of zeal, and very little tact. Is this what it was like for you, Steve? One night Howie got arrested. Not for the gospel, but for being stupid. Refused to comply with the police because the officer on scene was a woman. Is this what is was like for you, Steve? One night Howie was preaching, with the women and children across the street passing out tracts. There was a disturbance across the street as a man yelled curses and insults at Howie. Shane kept a close eye out. "HEY" Howie shouted in the exact some tone and pacing as his preaching "YOU PLAN ON COMING OVER HERE AND SAYING THAT, OR YOU PLAN ON HIDING BEHIND THE WOMEN AND CHILDREN?" "Uhh, Howie, what are you doing?" "It'll be fine, brother." The guy staggered off, swearing. "So Howie, if he had come over here, what exactly was your plan?" "I assumed you'd fight him. I've heard how you are." Shane rolled his eyes. "So what do you actually believe?" "The oneness and unity of all things." "Which means what?" "The oneness and unity. And no meat." "Look maybe I'm just stupid, but.."
One night as he was preaching a guy set off an air horn in his ear. But the unsympathetic police told him it wasn't 'assault' because he technically hadn't been touched. For the rest of his life Shane would suffer from the occasional ringing in that ear. Eventually he married that girl, and when her belly began to swell, Shane realized it was time to head back to that small Southern town to raise a family. They found a little church in that town and tried to be a help. Shane stood out in front of the Hardees across the street from his old high school and preached as old girl friends and old accomplices rolled by. As his moms friends rolled by. "Do you know what you're doing to our reputation in this town?" his mom asked. "Didn't raise you to be out there yelling at people. Folks think you've lost your mind. We know lots of people that go to church, and none of them are out there causing trouble like you." The irony wasn't lost on Shane. People were literally more upset at him now than they had been when he was stealing cars and chasing their daughters. Adding another layer of irony, he soon found that his biggest opponents were 'church people'. "Look, man, I'm a deacon in the church, but you can't be doing this"
"Preaching? Like the Bible says?" "I'm on your side,but people get mad." "They got mad at Jesus. They got mad at Paul..."
"I'm trying to help you, but fine, have it your way" He called the cops. As time went on he expanded his outreach to not just that little Southern town, but to larger towns up the road. 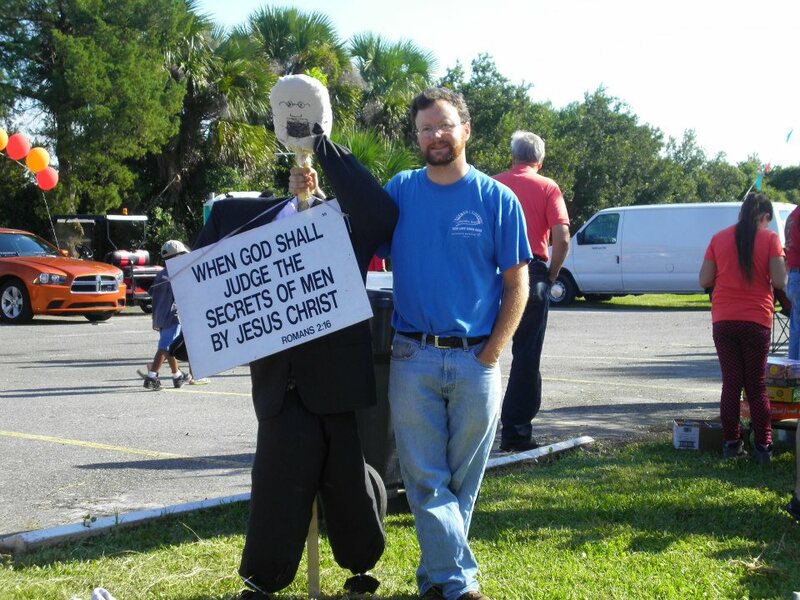 He started preaching at fairs and festivals and football games. Sometimes hated, mostly ignored. The church tolerated him, and his ministry. Their main purpose appeared to be assembling for the sake of assembling, and they paid lip service to how needful his ministry was. Then there was Darnel. Darnel is a story all his own. The story so far; Shane, a knucklehead from the deep South finds Jesus, with the help of a faithful man. The phone rang. It was one of the old crowd. "Hey man, just checking on you. Hadn't seen you." Shane wanted to tell him about what had happened. About Jesus. He wanted to tell him how everything was different now. Later on he told Steve the story. "I'm such a coward." A pause. "Is that supposed to make me feel better?" "Shane, why don't you go street preaching with us? I mean, unless you're too scared." The trap was sprung before he even saw it coming. Ok, Shane thought, keep cool, man, keep cool. It was Friday night in downtown, a place he'd been a million times before, but now he was holding a sign and trying to distribute gospel tracts. At least I don't have to preach, he thought. The platform was maybe 3 feet above street level. "Look, just pick a spot across the street and preach to that spot." Steve told him with a slap on the back. He picked a parked motorcycle, and then realized he had no idea what he was supposed to do next. He stood there for what seemed like an eternity, gawking at the multitude walking past him, his mind a remarkably blank slate. "What are you waiting for?" Steve asked. He blinked a few more times. "Umm.."
This seemed easier from the ground. "Verses, man. Quote some verses." The problem was, he didn't know any. One popped into his head. His voice sounded like it was coming from somebody else. He got through that verse and the one after it in a voice that barely made it across the sidewalk let alone across the street. Mercifully, he climbed down. "Good job!" Steve said with a slap on his back. "Write the date down in your Bible. You'll never be the same!" Shane had two thoughts. One was that Steve either hadn't witnessed the deplorable job he had done or that Steve was simply crazy. The other thought was that he was never doing this again. At the midweek service Steve flagged him down. "Hey, you need me to pick you up for Friday night street preaching?" Deer in the headlights stare. Mind cycling madly to come up with a way to truthfully blow off this wonderfully caring but kind of crazy person. "Great. See you at 6:30"
He found out that going the 2nd, 3rd, and 4th time was easier than going the first. He learned the verses written on the back of the tracts, and that helped his preaching. Steve's enthusiasm was contagious, even if he was nuts. But then it happened. One of the old crowd came staggering out of a bar while Shane was handing out tracts. "So this is where you been hiding." he said with a smirk as he looked around at the assembled crowd. Shane caught Steve's watchful glance. "Look Heath, I'm sorry we didn't talk about this when we were hanging out, but.."
"But now you're going to tell me about Jesus?" Paul leaned in close. "Pathetic." Shane thought about hitting him. It wouldn't be the first time, and Shane after all, was sober now. Heath shoved him just a bit as he left, and made his way down the street. Shane thought about something Steve had told him; you wont have to leave your old friends, they'll leave you. It didn't go much better with his family back in that little Southern town. 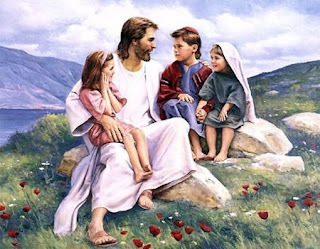 They , like him, knew all about Jesus and didn't have any interest in talking about it. 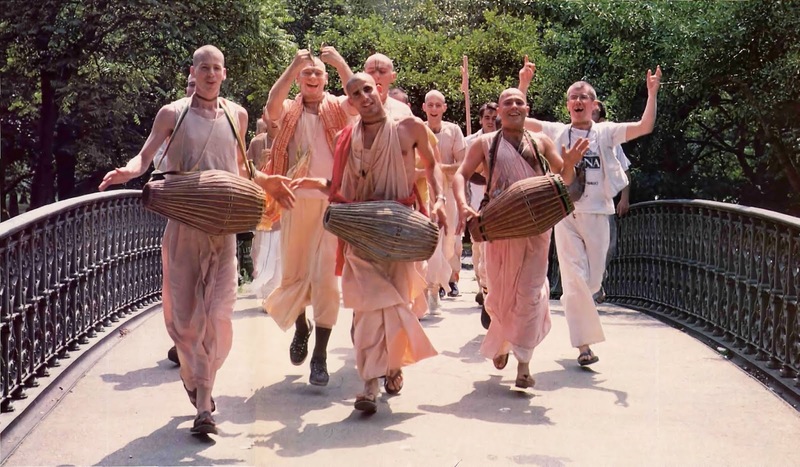 When they heard he was preaching on the street, the word 'cult' started to get thrown around. One night a rather boisterous homeless guy who was a regular part of the scenery attacked one of the preachers. Before he even thought about it, Shane had kicked the guys legs out from underneath him and dropped him to the sidewalk. Shane didn't say anything. The reaction had been automatic, a relic from the old days. His tribe had been attacked. You defend your tribe. "Go sit on the bus." Steve told him as somebody helped the guy up. "Look" Steve told him later "whatever you meant by that, we can't have that out there. We have worked too hard to have a good reputation with the cops. Control yourself, or you're done." Shane wondered to himself. I totally messed up the first life God gave me. Am I going to mess up this new life too? No, I'm not. He decided. By God's grace, and with God's help, I'm going to get a grip on this. So he labored. He studied his Bible. He involved himself in every ministry that would have him. He dealt with heretics of every conceivable flavor. He lost friends, and gained new ones. Old habits fell away, and new ones emerged. One of the other street preachers, a guy named Curtis, also preached at the nursing home, and offered him a slot. Preach indoors?, Shane wondered to himself. I'm not even sure I know how to do that. He stood in a room full of the invalid and aged, and talked to them like they were the reprobates he was used to dealing with. People who had known Jesus since before Shane was born sat there politely, let him be an idiot, and thanked him when he was done. He was also an artist, and Shane found that drawing while preaching helped him hold people's attention,. He was still an idiot, but at least it was mildly amusing to watch him multi-task. One afternoon he drew the ark of the covenant, and drew Christ crucified. He explained the parallels and how Christ fulfilled what the ark could not. An elderly woman with a Polish accent and a blue number tattooed on her arm accepted Christ. Years went by. Steve went on to his eternal reward. Cancer. Died with a smile on his face, victorious. Young guys joined the ministry, as young as Shane had been, but not nearly as stupid. One day Shane looked up and realized he was sort of in charge. By (sort of) popular request I present to you, in roughly the same character format as it originally appeared, but maybe in a more readable form, my story posted as part of the #vss365 writing exercise. By way of disclaimer, this story is only semi-autobiographical. People presented in an unfavorable light have had their names changed. Conversations have been condensed, and some events are told out of sequence. Some people are amalgams of more than one individual. But there really was a Steve, and there really is a Darnel. Shane re-positioned the ice-bag on his face. It felt like his eyeball was trying to push its way out of it's socket. But he had started that fight on purpose, and he knew that as soon as he could see clearly, he'd do it again. His boss looked disapprovingly at the black eye, and asked Shane, "Rough night? You know, you really ought to spread out your self-abuse a bit, give yourself time to heal." "Ah, what's the fun in that? Besides, I almost won." "'Almost' can get you killed." After work, Shane took the trolley downtown, There was still a place or two down there he hadn't been banned from. He was easily a block away when he saw the crowd, and heard the shouting. Assembled loosely on the corner was a group of well-dressed people. Some were holding signs, some were passing out literature. One fellow was saying something to people as they passed by, struggling to be heard over the traffic. Protesters? Shane wondered. Too late, Shane realized one of the crowd was addressing him. "Can I give you something to read?" The man pushed a small pamphlet into Shane's hand. He didn't seem angry at all. "What are y'all protesting? What's this all about?" "We're not protesters. We're out here telling people about Jesus!" Shane nodded absently. He was from the South. He knew all about Jesus. He didn't have time for this. He looked past the man to the neon lights. "One more thing. That tract I gave you has my number on the back. If you need anything,,"
Who gives their number to strangers, Shane thought. I gotta lose this guy. The man followed Shane's gaze to the front door of the bar. He made it to the watering hole, and by the time the night was over,a scratched cue ball had led to a fight, and though Shane avoided both ejection and arrest, he did find himself passing blood the next few days. Good times. Months went by and Shane had virtually forgotten about the encounter on the street corner. Life was a repetitive blur of riotous living followed by recovery. But then it happened. "Shane", his boss said "we need to talk.". He closed the door behind him, and sat down. "What you do on your own time is your own business, but you keep coming in here not ready to do the job. Beat up, drunk." Shane looked down at the floor. "I don't even know what to tell you, you're a good guy, but....your...appetites are killing you." Shane kept staring at the floor. Ashamed. The boss threw up his hands. "Get some help, or get it under control or..." The last option hung in the air, unspoken. Shane decided not to go carousing that night. Instead he sat in the dark in his apartment and listened to the wail of sirens. The phone rang. "Hey Shane." It was one of his fighting buddies. "I've got some bad news. That girl you been hanging around with? Liberty?" Shane scoffed "You do know that's just her stage name, right?" "Well, whatever, man. She ummm..she killed herself, man." "Did you hear me?" Shane hung up and sat in the dark some more. Shane sat there in the dark, a million miles away from the small Southern town of his childhood and felt like he didn't have a friend in the world. He had carved for himself a life of revelry; a thin veneer that disguised a hollow world of death. But what other life was there? I can't just sit here, Shane thought. He grabbed his jacket and a piece of paper fell out of the pocket. He picked it up. It was some sort of religious pamphlet with a handwritten number on it and the name "Steve". Where in the world did this come from, Shane asked himself. He flipped through it, but it was beyond him. Jesus stuff. Lots of red writing. Thees and thous. Suddenly he remembered the guy on the corner, and the standing offer. The phone rang once, then twice. Then an answer . "Hey umm, you don't know me, but we met once." "It was..you were downtown..with the signs." Shane suddenly realized he didn't really have a plan. "Things are ..pretty bad on this end, and maybe I could...get some advice?" Even as he said it, it sounded stupid. It sounded weak and needy. It sounded like he wasn't in control of his life. Like someone who watched Oprah. "Sure. where do you want to meet at?" The coffee shop was relatively empty. Shane got there early, put his back to the wall, as was his custom, and waited. Several times he started to bail, to just walk away. Things didn't seem that bad outside of his dark apartment. Then Steve walked in. Shane found himself talking. He told Steve everything. He told of his little hometown and of his move to the big city. He told him of the girl he'd lost, and of the raging fire in his soul that alcohol could not quench, of death and sorrow and pain. Steve listened. "Tell me Shane, what do you think is going to happen to you after you die?" Shane wasn't expecting a question. He was expecting advice, like how to get a grip on himself. "I don't know. I've never thought much about it." "I'm going to talk to you like you're a man, OK? I do this because you need it." Shane nodded. "For a man to play with death like you have, and not be prepared for it, is stupid." "Wait. Your counsel to me is to call me stupid?" Steve shrugged. "Would you rather I lie to you?" "Great. So what happens to you when your luck finally runs out?" "Heaven? I mean, you've told me a lot, but I daresay you haven't told me everything. You haven't told me everything God knows about you. If God laid your whole life out before you, every thought, every deed, every intention and gave you what you deserve for how you've lived.."
"I've done some good stuff." "Congratulations. Enough to undo the bad? Outweigh it? Outrun it?" Shane didn't have an answer. "The truth is, you've made a mess of things. And you're smart enough to understand that actions have consequences." Steve tapped the table with his finger. "Your sin is killing you, and damning your soul, Shane." Shane felt a hot flush invade his cheeks. "Right, so that's why I called you. I want to do better." "Commendable. But it won't help. You're condemned already. You cant unring a bell, you cant unrob a bank." A quiet stare. "So there's no hope." For the next several minutes, Steve told him about Jesus. But not the Jesus Shane had half-learned about through the cultural osmosis of growing up in the Bible Belt. This was Somebody quite different. To his credit, for once in his life, Shane kept his big mouth shut. If this had been a really bad Kirk Cameron movie, Shane would have fallen to his knees in blubbery repentance. But he didn't. He listened quietly, asked one or two questions, and then thanked Steve for his time. But he thought about it. A lot. And he kept Steve's number. One thought in particular wouldn't leave him alone. Shane had no problem with the idea that God was just, and holy. 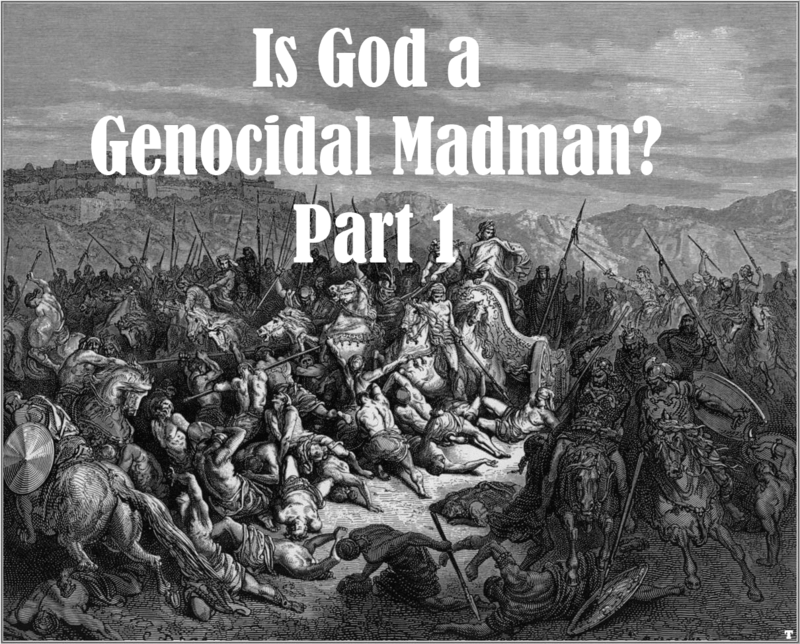 It made sense that sin would offend God and even anger Him. It even made sense that sin carried with it a penalty. That wasn't what bothered him. What bothered Shane was the idea that God loved sinners. His enemies. Loved church folks? Sure. But loved drunks and bar fighters and deviants? Loved people who proved by their lives that they didn't love Him? It ran so contrary to Shane's own nature that it puzzled him. He was familiar with the concept of God 'loving the ungodly', but it was hard to look at his own life and see anything there that would attract the concern of Someone holy and pure. Frankly the whole thing unnerved him. Maybe I should read the Bible, he thought. Shane was a pretty smart guy, and pretty well-read. But this Bible (that he bought on clearance and hid from his drinking buddies) was beyond him. Maybe Steve can explain some of this, he thought. As it turned out, Steve had one night free a week; Thursdays. "We can meet at the coffee shop and talk. I'll do my best to answer your questions." Shane didn't really want a regular commitment; he just wanted some answers. Shane sat in the club where 'Liberty' used to work, nursing a drink. Was it always so dark in here, he wondered. The rhythm of riotous living was as familiar to him as his own heartbeat, yet he felt completely alone. Plus, his conscience gnawed at him. You're a real piece of work, Shane told himself. Steve has a wife and a family and he's willing to meet with you, answer your questions, be your friend. But you can't bear being away from the dark, can you? Shut up, Shane told himself. Fine, he told his conscience. I'll meet with him. And you'll be sober? Yes, I'll be sober. I'll behave myself at least one night a week. He walked out of the club, and reached for his phone. "I have to be honest, I thought I'd never hear from you again." Steve chirped as he sat down across from Shane. "I've been meaning to ask you, why give your number out to strangers?" Steve shrugged. "Done it for years. Nobody ever calls." And so it began. Every Thursday the two men would meet, and every Friday Shane would be free of hangovers and black eyes. Of course there were still 6 more nights to the week, but Shane found that it was harder and harder to enjoy the revelry. Shane quickly discovered that his mental image of Jesus was all wrong. He pictured a nice guy with little kids on his lap telling people to be nice. The reality was very different. It was strength and compassion and righteousness. He saw a man, but more than a man. And the more he saw, the worse Shane felt about the sort of man that he was, the larger the chasm appeared between him and Him. It seemed more and more improbable that mercy was available for someone who had wrecked their life. "So, Shane, now that we've covered some of the basics....what's your problem?" "Umm, I don't get what you mean." "Well, I'm glad we're meeting, but if all you do is die in your sins with a little more information than you had before I don't think I've helped you any." "Do you talk to everybody this way?" "It's a sign of respect. So what about it?" "Your sin. You need to do some serious business with God." Sedentary self-important armchair theologians would blow their fuses, strip their gears, and wear out their dusty Greek lexicons trying to quantify ,explain and define what happened next.One of God's enemies surrendered, and the filthy rags of perdition were traded for the imputed righteousness of God's Son. Under the right circumstances,a little bit of repentance goes a long way.There was no fanfare. No choir of angels. No beam of light piercing the far-flung heavens to light upon the brow of the repentant, By all outward appearances, it was quite anti-climatic. But the real story was just getting started. I have a twitter account, and honestly, I'm not sure why. But one of the things that have come out of it is a daily (ish) writing exercise flying under the banner of #vss365 that quickly became a semi-autobiographical story, at least on my part.. I have had to take some liberties with the sequence of events. I have had to condense some conversations and I've changed some names, including my own. But here you have it, one screenshot at a time, assembled for your edification. It's a common trope among scorners to present passages like this one to the Christian in order to confront the Christian with the presumably bloodthirsty and vengeful God of the Bible. This highlights the tragic misunderstanding the scorner has towards the Bible, and their insincerity while 'searching for the truth'. Even more tragic , however, is how many Christians have no real reply for this, instead adopting a sort of embarrassed stance with some believers drawing at least a mental distinction between the 'mean God' of the Old Testament and the 'nice guy Jesus' of the New Testament. The Bible offers no such path of escape, though. The Bible claims to be an accurate, inspired, consistent revelation of the Creator to His creation.The same God quoted in Deuteronomy 20 is, according to scripture, the same God who took on the likeness of sinful flesh and gave His life on Calvary in order to redeem His enemies. The Bible does not allow an honest reader to draw any distinction between the two. I submit to you, as a Bible believer, that we owe it to ourselves to face this issue. After all, a Christianity that cannot withstand the scrutiny of intellectual midgets like Voltaire or the scribbling of a self-professed monkey man like Dawkins is not a Christianity worth defending. Rather than dismiss this attribute of God, we should examine in the full light of scripture. 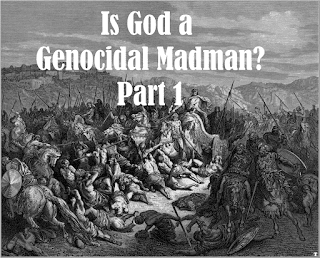 In doing so, we will find that the removal of the Canaanites was not only consistent with God's character throughout the Bible, but was the morally right thing to do. 1. You Aren't God, He is. "Who hath measured the waters in the hollow of his hand, and meted out heaven with the span, and comprehended the dust of the earth in a measure, and weighed the mountains in scales, and the hills in a balance? Who hath directed the Spirit of the LORD, or being his counsellor hath taught him? With whom took he counsel, and who instructed him, and taught him in the path of judgment, and taught him knowledge, and shewed to him the way of understanding? Behold, the nations are as a drop of a bucket, and are counted as the small dust of the balance: behold, he taketh up the isles as a very little thing. ....All nations before him are as nothing; and they are counted to him less than nothing, and vanity." In Isaiah 59:8-9 God says, in unequivocal terms that he is smarter than you. God asserts in Romans 9 that he stands above mankind, and outside the realm of man's ability to appropriately assess His actions. Nay but, O man, who art thou that repliest against God? Shall the thing formed say to him that formed it, Why hast thou made me thus?Hath not the potter power over the clay, of the same lump to make one vessel unto honour, and another unto dishonour? The Lord, when speaking to Job, makes it very clear that Job should remember his place in the grand scheme of things. Who is this that darkeneth counsel by words without knowledge?Gird up now thy loins like a man; for I will demand of thee, and answer thou me. Where wast thou when I laid the foundations of the earth? declare, if thou hast understanding. Who hath laid the measures thereof, if thou knowest? or who hath stretched the line upon it? Whereupon are the foundations thereof fastened? or who laid the corner stone thereof; When the morning stars sang together, and all the sons of God shouted for joy? Or who shut up the sea with doors, when it brake forth, as if it had issued out of the womb? When I made the cloud the garment thereof, and thick darkness a swaddlingband for it, And brake up for it my decreed place, and set bars and doors, And said, Hitherto shalt thou come, but no further: and here shall thy proud waves be stayed? Hast thou commanded the morning since thy days; and caused the dayspring to know his place; That it might take hold of the ends of the earth, that the wicked might be shaken out of it? ..... Hast thou entered into the springs of the sea? or hast thou walked in the search of the depth? Have the gates of death been opened unto thee? or hast thou seen the doors of the shadow of death? Hast thou perceived the breadth of the earth? declare if thou knowest it all. Where is the way where light dwelleth? and as for darkness, where is the place thereof, That thou shouldest take it to the bound thereof, and that thou shouldest know the paths to the house thereof? Knowest thou it, because thou wast then born? or because the number of thy days is great? Hast thou entered into the treasures of the snow? or hast thou seen the treasures of the hail, Which I have reserved against the time of trouble, against the day of battle and war? By what way is the light parted, which scattereth the east wind upon the earth? Who hath divided a watercourse for the overflowing of waters, or a way for the lightning of thunder; To cause it to rain on the earth, where no man is; on the wilderness, wherein there is no man; To satisfy the desolate and waste ground; and to cause the bud of the tender herb to spring forth? Hath the rain a father? or who hath begotten the drops of dew? Out of whose womb came the ice? and the hoary frost of heaven, who hath gendered it? ... Canst thou bind the sweet influences of Pleiades, or loose the bands of Orion? Canst thou bring forth Mazzaroth in his season? or canst thou guide Arcturus with his sons? Knowest thou the ordinances of heaven? canst thou set the dominion thereof in the earth? Canst thou lift up thy voice to the clouds, that abundance of waters may cover thee? Canst thou send lightnings, that they may go, and say unto thee, Here we are? Who hath put wisdom in the inward parts? or who hath given understanding to the heart? Who can number the clouds in wisdom? or who can stay the bottles of heaven, When the dust groweth into hardness, and the clods cleave fast together? Wilt thou hunt the prey for the lion? or fill the appetite of the young lions,When they couch in their dens, and abide in the covert to lie in wait?Who provideth for the raven his food? when his young ones cry unto God, they wander for lack of meat. In Deut 32, God claims to have the final authority in matters of life and death. See now that I, even I, am he, and there is no god with me: I kill, and I make alive; I wound, and I heal: neither is there any that can deliver out of my hand.For I lift up my hand to heaven, and say, I live for ever. If I whet my glittering sword, and mine hand take hold on judgment; I will render vengeance to mine enemies, and will reward them that hate me. Just to reiterate, God is smarter, wiser, and more powerful than His critics. He has superior intellect, superior information, superior ability and regularly does things that no man is even capable of understanding. He made all things, and He sustains all things. In fact, He is so far ahead of the curve of human intellect that His ways are "past finding out". God doesn't always explain Himself because not only are we not owed an explanation, but we wouldn't understand His explanation if He did. That's interesting, because according to Romans 1, God wrote His law on the hearts of men, giving them a hard-wired sense of right and wrong, however marred by sin and muddled by culture it may be. God, as a moral being, created beings with a sense of morality derived from Him. He then interacts with those beings, knowing that His creation has the capacity to assess His actions in the light of the rules He laid down and based on the information He has provided them. He ensures, through scripture that an accurate record of these interactions exists for future humans to see. It's perfectly legitimate for a man to look at what God has revealed about Himself, and, use his God-given sense of morality to assess those actions taken by God. But to make a proper assessment, a man must weigh all the factors before him, not just he ones that fit his bias against his Creator. The scoffer and the scorner see what they want to see, blinded by the darkness of their own heart. Fret not, this is not my entire argument. I'm just laying the groundwork. Our community has an annual event; a downtown festival of sorts that they dub 'The Scarecrow Stroll. When it began it was truly a community endeavor in which families would build a scarecrow and display it in the local downtown area for several days, culminating in 'the Stroll'. 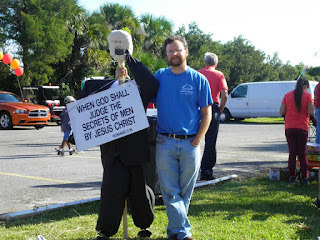 We built a scarecrow every year for years and used it as platform to get the gospel out. As of late though, the Stroll has turned into a promotional event; a Halloween festival with local businesses and politicians throwing together some half-hearted scarecrow and handing out candy to kids in costumes. I’m opposed to Halloween, but I can’t rally a consistent argument against free candy, so my wife takes the kids down there with gym bags and we load up, sans costumes. Later on, I extract a small portion of the proceeds that my children call ‘the chocolate tax’. The way this particular day worked was that I went street preaching, and then met my wife downtown. We walked around, looked at scarecrows, talked to our neighbors and scarfed up free candy. But I was unsettled the whole time. Maybe it’s because I was still in ‘street mode’ or whatever, but I looked at this crowd of easily over a thousand people, including church folks , and realized that, other than me getting rid of 20 or 30 tracts, there was no visible gospel witness at this event. Nobody was preaching, nobody was handing out tracts, nothing. I’m not advocating a church get a booth down there as that would be inappropriate. Besides most church booths are, in my opinion, horribly ineffective and come across as a plea of ‘Please like us! We’re nice!’. For example, if the early church had opened up a booth at the Jupiter festival in pagan Rome and made balloon animals, I hope we can agree that would have been a little bit 'off-mission'. I freely admit to you, dear readers, that I don’t know what I think should be done. I think the church has an obligation to distance itself from some aspects of the culture, and to purposefully visibly abstain from some of the more questionable cultural practices. I think you can be present at an event without being part of it. You do what you're supposed to do and people will understand that you aren't with them in their revelry. You wont even have to tell them. What is our obligation, as the church, and as individuals, to the community at events like this? I think it’s clear; the people in our towns need to be confronted with the gospel at every opportunity. That usually means they will hate you, and most professing Christians will be annoyed with you. That’s my little red wagon to pull, and I pull it with gusto. I also freely admit to being a workaholic in the ministry. I see every public gathering as an chance to present the gospel. If it's within 100 miles of my house and I can make it there, I try. 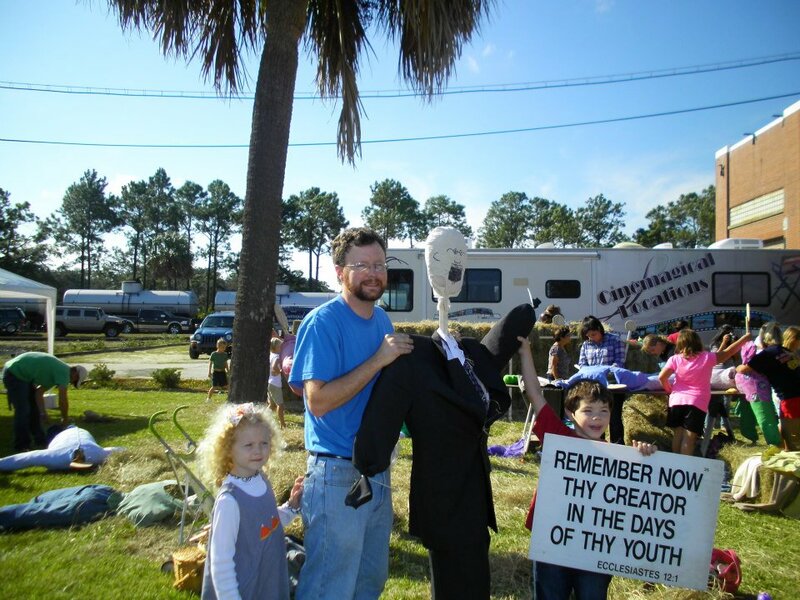 I preach at street corners and football games and parades and festivals. I preach on vacation. I preach when I'm sick. I've preached in every weather condition except snow. I relish in buying tracts and putting gas in the car to drive hither and yon preaching. Jesus Christ took the handwriting of ordinances that was against me and took them out of the way, nailing them to His cross. I owe Him my life. I owe Him my time. I owe my fellow man the chance to hear what God has done for them and what He will do to them in they persist in their rebellion. But I also have a family, and I also have a wife that sometimes just wants to walk around and look at scarecrows and scarf up free candy without me being 'that guy' that disrupts everybodys good time. She wants to be, for lack of a better word,'normal'. I do have obligations to her. I have an obligation to not make her life any harder than it has to be. But I also am under orders from the King. This tug of war takes up a significant portion of my thoughts. I left the Stroll, as I leave many public gatherings, thinking about the people there. I thought about what I have and what they need and how to balance family life and ministry life. I thought about how they ought not be separate things, but sometimes they are. I'm only one guy who has been given the biggest job ever. How do I do it? And how do I get the gospel to them next year?